Giant Cell Tumours: These are solid tumours formed as a result of trauma caused to a tendon sheath, which stimulates the abnormal growth of cells. Other wrist tumours include fat cell tumours (lipomas), nerve cell (neuromas) and nerve sheath tumours, and connective tissue tumours (fibromas). 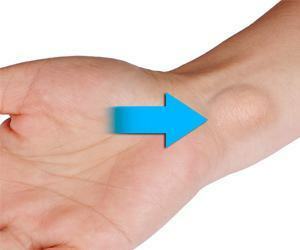 Wrist tumours may be associated with pain, swelling, loss of flexibility and weakness or numbness. They can be diagnosed with physical examination and imaging tests such as X-rays, MRI and CT scan. Your doctor may also order a biopsy to confirm the diagnosis of the tumour and ascertain if they are benign or malignant. Treatments mainly involve anti-inflammatory medications, use of splints and draining of the fluid from the cyst. Surgical treatment includes excision of the tumour. Excision is usually performed under local anaesthesia and is an outpatient procedure.